There are many situations where a reasonably accurate count of persons, items, or animals must be taken. In the case of theaters or auditoriums, livestock farms or theme-park rides, head-counts and item counts must be taken. The easiest and most accurate way to do this is with the use of a hand counter. Let's say, for instance, that a news outlet wants to estimate the number of people who showed up at a rally or a demonstration. By taking an accurate count of a certain area, then extrapolating that count to cover the rest of the area, a very close estimate of the total number in attendance can be found. If a concert hall or outdoor area with open admission has a limitation on the total number of spectators, a hand counter can prevent the event managers from running afoul of fire codes and inspectors. Hand counters are simple devices, but they provide an invaluable service to anyone running or reporting on an event. One of the biggest advantages of these devices is that the user can continue to watch what is going on without looking at the counting device in his or her hand. This is a big advantage to anyone who is responsible for crowd control. Another possible use is in school administration. 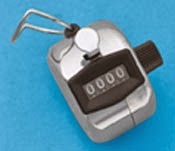 If the supervising teacher or administrator wishes to maintain a certain number of students in a given location, a tally counter can enable this method of management very well. A good tally counter will do the job without fancy batteries, without recharging. This type of device is simple, but very reliable and effective. When there is any event where a large number of individuals must be counted, there is always a bit of stress involved with keep track of the number of individuals. This is true in farm and factory settings as well as venues where a large group of people are milling around. A simple aid like these will alleviate a lot of the stress involved in keeping an accurate count of the number in the group. In a farm setting, where livestock are being moved, a counter will enable the user to maintain control of the herd while still keeping a good count of the number of head. These devices can also be used to maintain a count of how many times something has transpired. Take the example of a political speech. Let's say I want to count how many times a politician has used the phrase “The American people,” or “the fiscal cliff” for example. Trying to note things down with a pencil while attempting to comprehend what is being said is not easy, and there is a large margin for error, especially if taking a shot of tequila every time the phrase is uttered is involved. With a counter, the answer to a question like that is easily accomplished and without too much undue distraction from the content of the speech or the drinking of tequila. Does anyone ever read these articles????? These simple devices are versatile, convenient, and have a very wide range of uses. It's hard to imagine any organizations functioning well without them.